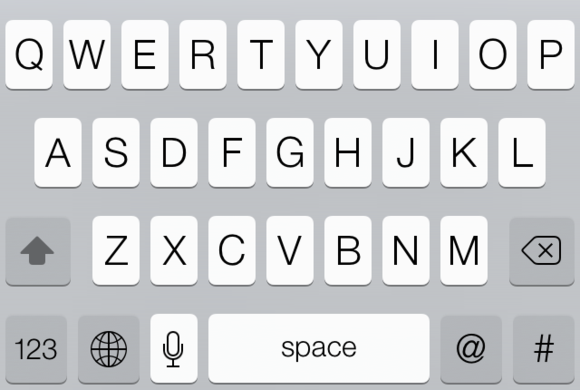 The iOS 7 keyboard displays different keys depending on an app’s function. Messages’ keyboard is simple and spare. When you use Mail, on the other hand, you’ll see the @ button prominently displayed in the bottom row of the keyboard, so you can easily type email addresses. Before, you had to press the 123 key to get to it. In Twitter apps, you’ll see a keyboard that includes both the @ and # symbols—the former for Twitter usernames, and the latter for hashtags. In most Twitter apps, symbols now appear on the keyboard that let you type Twitter usernames and hashtags more easily. Although the iOS keyboard often anticipates your needs, you’ll probably be surprised to see some buttons missing. The ‘.com’ key that formerly appeared when you typed, for instance, in Safari’s address field, has gone AWOL. Don’t fret; there’s still a .com shortcut, you just need to know where to find it. Tap and hold the period (.) key to make a pop-up menu appear. Then, slide your finger up to the ‘.com’ button. In Safari, the ‘.com’ button isn’t far away, if you know where to look. If your region settings are not set to United States, you’ll see different options when you hold the period key: If you’re in the United Kingdom, for example, you’ll see ‘.co.uk’; if you’re in France, you’ll see ‘.fr’; and so on. This shortcut isn’t new, but it’s much more useful now that the direct ‘.com’ button is gone. Do you need to type accented characters? How about currency symbols, like the £ or € symbol? There’s a quick way to do this. For accented characters, tap and hold the letter you want to type: If you want to produce an é, then tap and hold the E key. You’ll see a pop-up menu with a number of accented characters you can choose from. Just slide your finger to the one you want to use, and then release. 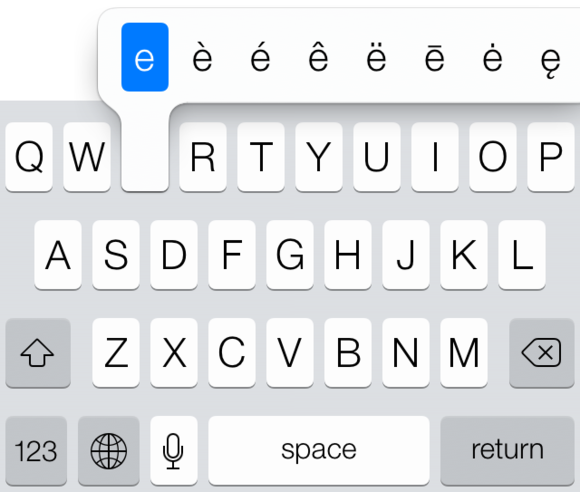 You can type dozens of different accented characters easily on your iOS device. 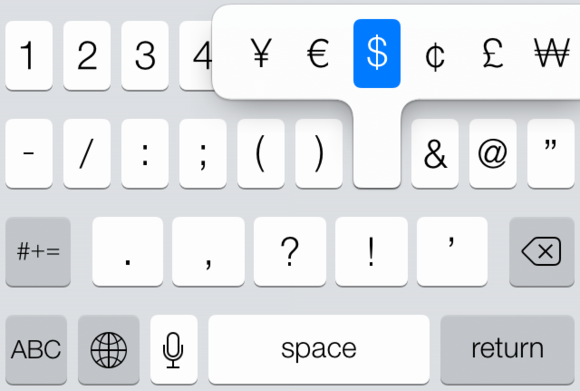 Type lots of currency symbols easily on your iPhone or iPad. You’ll find more special characters if you tap and hold different punctuation marks. Typing punctuation can be a drag on an iOS device. Take the humble question mark. First, you must tap 123 key to get to the number and punctuation keyboard, then tap the question-mark (?) key, and then tap the ABC key to get back to the letter keyboard. Here’s a quicker way to do it. Tap and hold the 123 key. Now, without removing your finger from the keyboard, slide your finger over to the question-mark key (or any other punctuation mark) and then release. The keyboard will insert your symbol and automatically switch back to the ABC keyboard. You know those little pictures that some people include in text messages and tweets? They’re called Emoji, and iOS comes with a special keyboard with hundreds of fun characters and symbols. You can add this to your iOS device so that you, too, can send funny symbols to your friends. To do this, go to Settings > General > Keyboards > Keyboard. Tap Add New Keyboard and scroll down until you find Emoji. Tap it to add it to your keyboards. Add the Emoji keyboard to access hundreds of fun symbols. 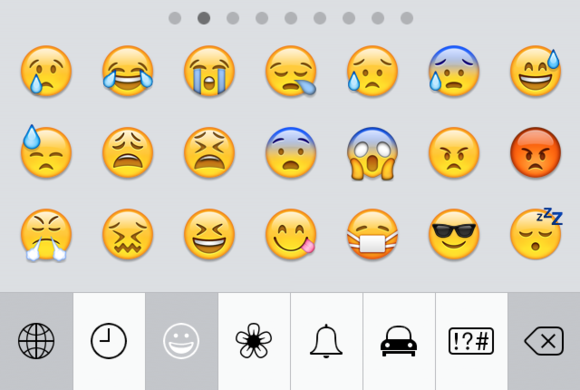 A number of buttons appear at the bottom of the keyboard; each one displays a different category of Emoji characters. Above the characters, dots show how many “pages” of symbols there are in each category: Just swipe to the left or right to change what you can access. To go back to the normal keyboard, just tap the globe button again. 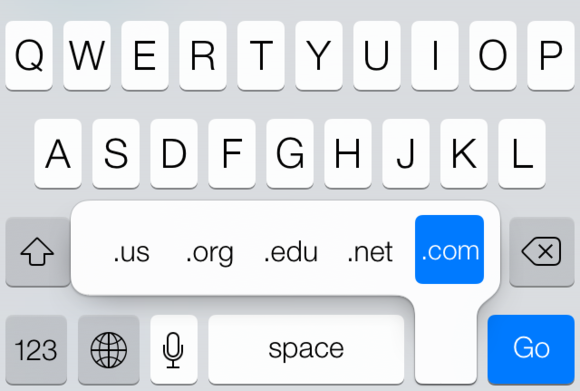 Typing is a lot easier when you know these simple iOS 7 tricks.